Needing time to contemplate her troubled marriage, Tessa MacRae agrees to spend the summer helping her mother and grandmother clean out the family home in Virginia's Shenandoah Valley. But the three women have never been close. Helen, the family matriarch, is domineering and sharp-tongued. Nancy, Tessa's mother, appears to be little more than a social climber. And Tessa herself is in turmoil following a family tragedy that has affected them all. Now, with the gift of time, Tessa's eyes are opened, and she begins to see her mother and grandmother for the flawed but courageous women they are. As she restores a vintage wedding-ring quilt pieced by her grandmother and quilted by her mother, the secrets that have shadowed their lives unfold at last. And each woman discovers that sometimes you have to clean house to find the things you thought were lost forever. 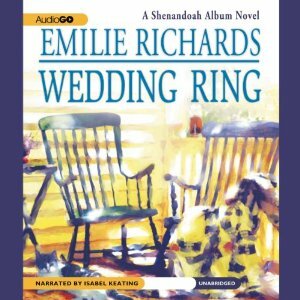 Wedding Ring was a reread for me, and I am so pleased I chose to do so by the audiobook version. I loved it the first time I read it, and totally fell in love with the characters and story line all over again as I listened to it. To be honest I had forgotten many details of the story - I just carried the general feel of the story with me. Now I have a refreshed memory of it! Isabel Keating does a fabulous job in the narration. I loved her Helen voice and the way she just totally brought her to life for me. Whenever I thought of this book I remembered the opening scene when Helen was holed up in her house and her daughter Nancy and grand daughter Tessa were trying to get in. Wonderful scene. The story follows the lives of these three remarkable women. We are taken back in time to Helen's early life and see where she came from and her joys and sorrows. We are also taken back in time to Nancy's earlier times too. As the story develops changes happen for all three women, and they are bonded together in ways they would not have thought of earlier. In the beginning they are not that close. Tessa has had heartbreak in her life and she is estranged from her husband. Nancy seems to be a bit of a socialite and Nancy - well she is a bit crotchety! I loved her anyway. There is Cissy Mowrey as well who lives nearby, she is pregnant and unmarried and Tessa and Helen reach out to her. It is with this series I began my obsession with quilting, Helen is an expert quilter and I just wish she was a real live actual person and I'd love to go see her quilts. I loved the way her daughter Nancy, helped her see the value in what she had done. I must say the Quilt Along With Emilie Richards that goes with this book is also a favourite and I hope to try out a few of the Sunbonnet Sue examples. I have plans! In short - love, love, loved it all. Guess who will be revisiting the whole series via audiobook! Sounds wonderful! The companion quilting book sounds wonderful too. I hope you share photos of the Sunbonnet Sue examples. I will do Pat although will be a little while before I get to it. So many projects, but I will be doing a mini one on another quilt so will share that one day this year! This sounds like a good one. I love that name, Shenandoah. Isn't she wonderful Kathryn. She's one of the authors I review for the publication I work for. Yes will be looking forward to your review of When We Were Sisters Debbie. Yet another audiobook to check out... It reminds me a bit of How to Make an American Quilt, but it's been forever since I read that book or watched the movie! I never did see that movie Kate - I should check it out one of these days. This was my first book by Emilie Richards and I absolutely loved it. I need to reread it or preferably listen to it. I'm glad to hear the narrator did justice to the story. I'm not a quilter but this book had me fascinated by them! It wasn't quite my first of hers, but very close to my beginning of reading her books. This sounds good! I am a sucker for setting, and I love the Shenandoah Valley! Your review makes this a tempting addition to my Audible library. I'll have to add to my wish list.